You aren’t worried about finding the cheapest breast pump because you know you’ll be giving your unit a workout every single day. You need something that will hold up to your demands. You plan to exclusively breastfeed and you don’t want any formula in the equation at all. If you’re concerned your breast milk production may not be enough to fill the demands of your hungry baby, you’ll want to read our Spectra S2 Breast Pump Review to see what this highly-regarded model can offer you. The Spectra Baby USA S2 can be used as a double or single pump. It’s a closed system that has a letdown mode and offers adjustable settings. This pump offers hospital-grade strength. Its closed system is good for hygiene purposes. The price should be within reach for many different budget constraints. Can’t be used with batteries. 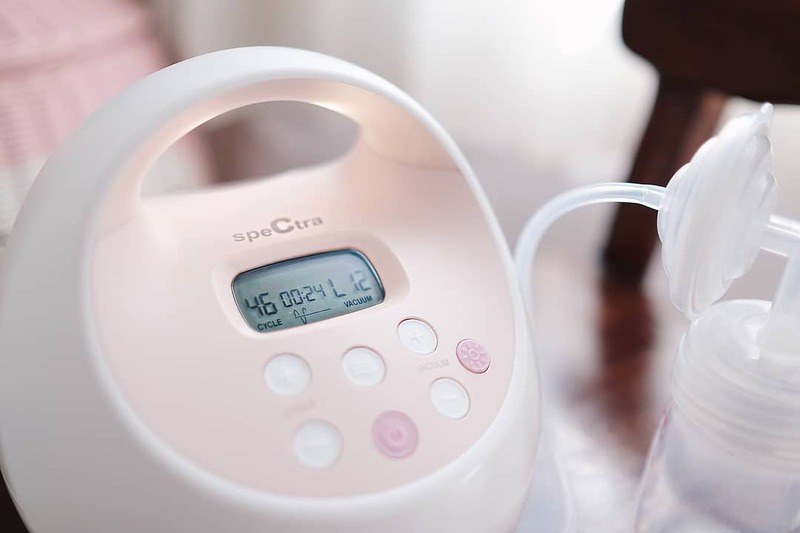 Moms who are worried that some of their breast milk particles will reach the motor or other parts of the pump that aren’t routinely washed can breathe a sigh of relief with the Spectra S2. Since it is a closed system, it ensures that milk will stay only in the parts of the pump it should. That eliminates the risk of mold or bacteria tainting your breast milk without you realizing it. Moms who are concerned with the safety of their baby’s milk will find this to be a huge plus. While some moms aren’t bothered by a louder pump at work, some moms are a little more private about breastfeeding. Let’s face it. There are a lot of immature people out there, and in the workforce, comments from coworkers about breastfeeding can still be a bit embarrassing for some women in certain settings. The quiet motor on the S2 may make those women feel more comfortable expressing milk at work. Generally, while you are pumping, you just do both breasts at once because it’s a time saver. But if your baby is hungry and you’re already nursing him, you might as well hook yourself up to this pump and express milk from the other breast at the same time. Massaging your breasts is a great way to stimulate your letdown mode where your body realizes that it’s time to let the milk start flowing. 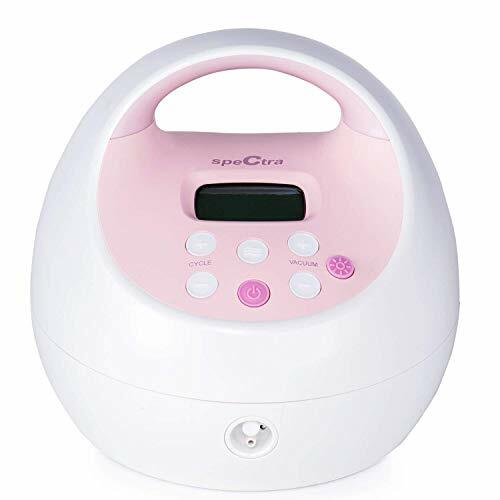 Instead of having to massage your breasts manually, you can let this machine do all the work for you while you sit back and try to relax. Finding the Goldilocks zone of the perfect suction and speed is much easier when you are in charge of the adjustments. You can adjust the suction both in the letdown mode or expression mode with this model. As a new mom, you’ll be sleep deprived and stumbling around in the middle of the night frequently in an attempt to feed your baby. If you’re getting up to pump every three hours in an effort to stockpile enough milk to meet your baby’s growing nutritional needs, a nightlight will be a major benefit to you. Although you’ll pay for this added feature, the S1 is a good option for women who love the quality performance that the S2 provides, but also want to be able to use the machine with batteries. Moms who want this breast pump to fit in with their boy’s nursery colors may like that this pump is blue. Moms who have more month than money left by the time they pay their bills will like the affordability of the Quiet Expressions pump. For what you’ll save buying this lower-priced pump instead of the competitors’ pumps, you’ll still have enough money left to buy bottles. Moms who have tried other breast pumps and found them too harsh or uncomfortable may want to check out the NUK Expressive, which uses breast cushions to try to take some of the sting out of breastfeeding. Moms who like the excitement of getting a lot of extras with their breast pump may want to opt for the Medela Freestyle. It comes with a portable cooler and ice packs for storing your breast milk on the go. Plus you get a carry-all bag that will hold the pump and all the accessories. Moms who want to spend more time with their baby and less time cleaning will want to consider Purely Yours. This closed system leaves you with very few parts to clean. For being one of the more affordable breast pumps on the market, the S2 offers moms peace of mind when it comes to hygiene. The quiet pumping experience will be appreciated by moms in the workplace or moms who simply are looking to make the pumping process feel a little less mechanical.